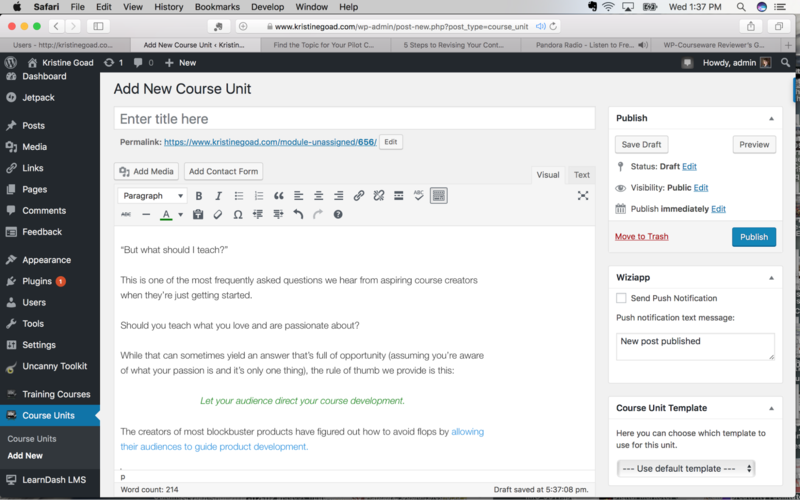 Home » Blog » WP Courseware Review: Is It the Easiest WordPress Plugin for Creating Your Online Course? I dreaded testing another WordPress plugin for course creation. 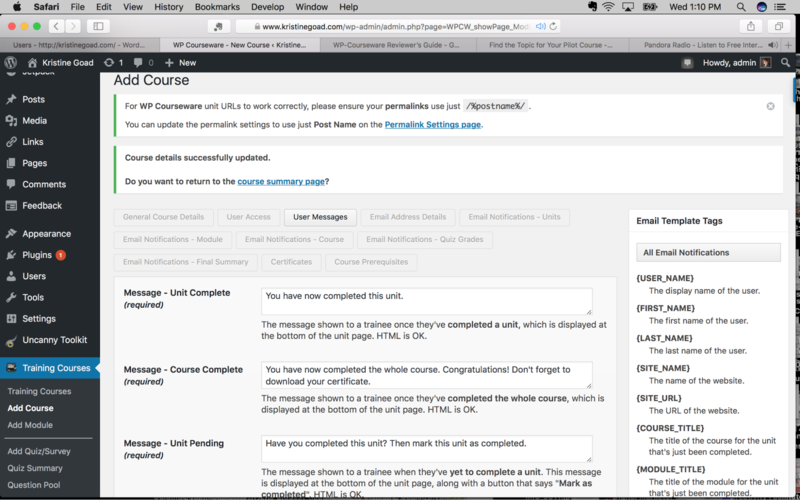 My previous experience with a WordPress LMS plugin resulted in me locking myself out of the backend dashboard of my website when I created—and subsequently deleted—a course login feature for students! The panic of that experience was still fresh, and I wasn’t keen on breaking anything else on my site. Needless to say, I reviewed the WP Courseware plugin with serious trepidation. 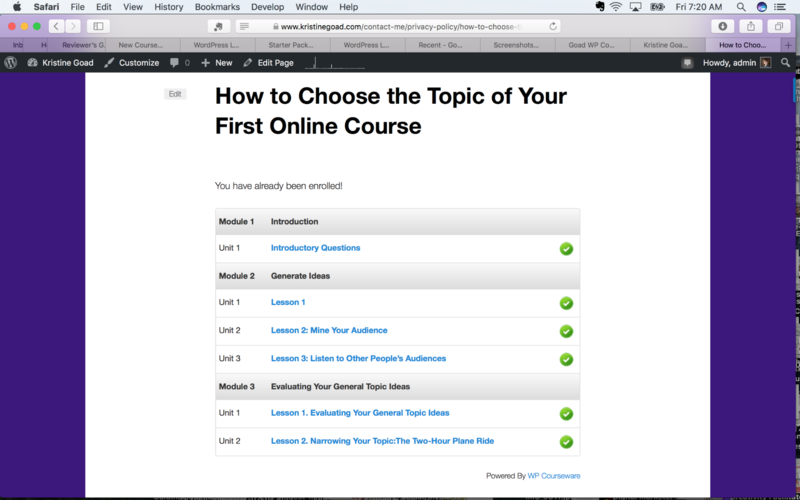 I’m neither a WordPress nor online course creation pro. I’ve had a modest WordPress website that I have built and rebuilt myself several times over the past six years, but I know nothing about HTML, PHP, or CSS. I’m a drag-and-drop kind of girl, so I needed the WP Courseware plugin to make good on its promise of making course creation drag-and-drop easy. The “Ease of Drag & Drop” Promise Fulfilled? Turns out, WP Courseware was quite easy to use! 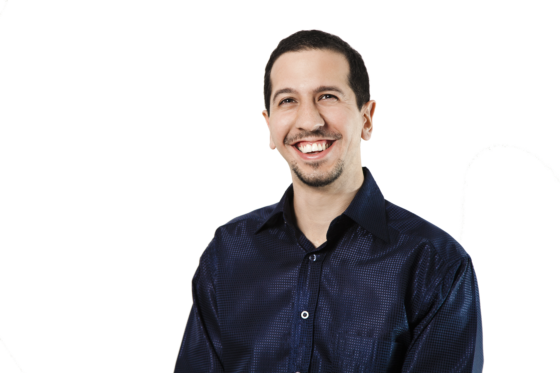 Not only did I not break anything, but I created my online course in about 90 minutes and found the process to be logical and intuitive. If you have any experience using WordPress for blogging or for maintaining a website, I think you’ll find WP Courseware a comfortable fit. The plugin walks you through the course creation process in an orderly way. It has several standard fields already created that you just fill in with information about your course. And it’s easy for you to structure your content and your content delivery (whether the modules are all available immediately, unlock at certain time intervals, or unlock based on a student’s progress) to suit your needs and teaching style. And it’s easy for you to structure your content and your content delivery (whether the modules are all available immediately, unlock at certain time intervals, or unlock based on a student’s progress) to suit your needs and teaching style. This page at the top of the plugin menu was a delightful surprise—and my favorite thing about this plugin. 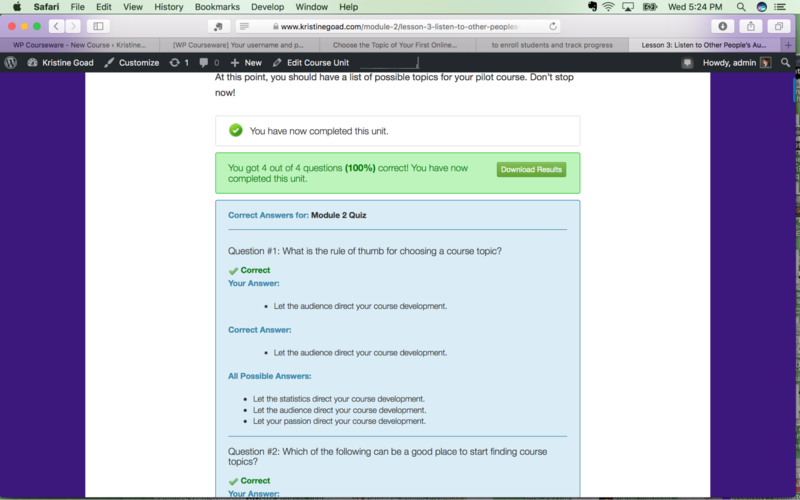 You’ll notice in the screenshot below, there are several options here to customize your course, configure how students will be given access to the course, plan and manage your communications with students as they progress through the course, set up your email, create certificates, and set course prerequisites. This dashboard, for me, is the genius of WP Courseware. It lets you make all the necessary decisions about your course delivery and student experience in one place. And then automates all of the student communication processes with just a few clicks! 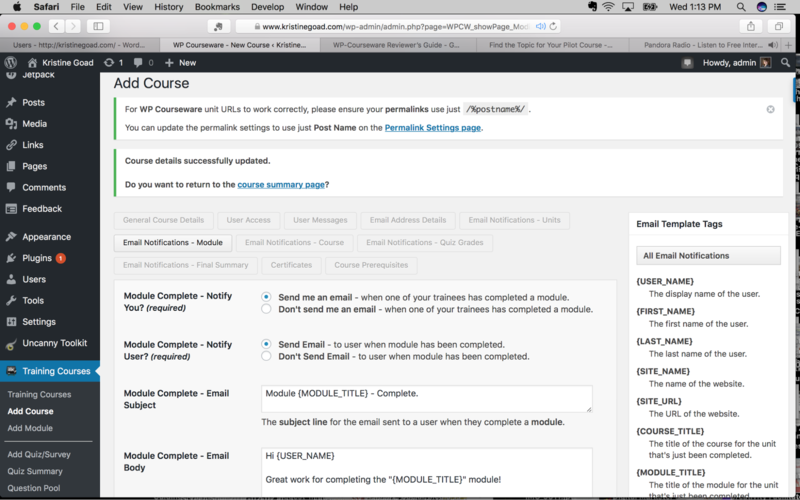 And take a look at the page where you configure the Email Notifications your students receive as they complete modules. Notice on the right side, there is a column of tags you can use to customize your messages, so you essentially have your own email contact system built right into your course. 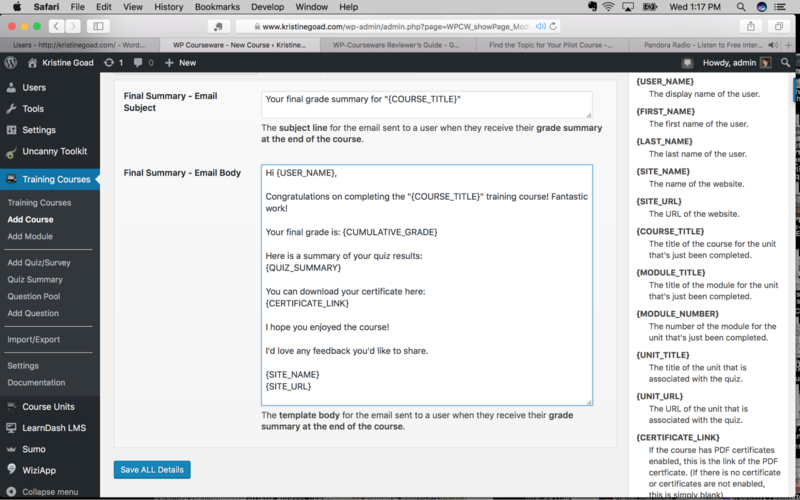 Here’s a look at the Final Summary Email you can send your student when they complete your course. Note that you can assign a final grade, include a summary of quiz results, and provide the link for the student to download and print their completion certificate. 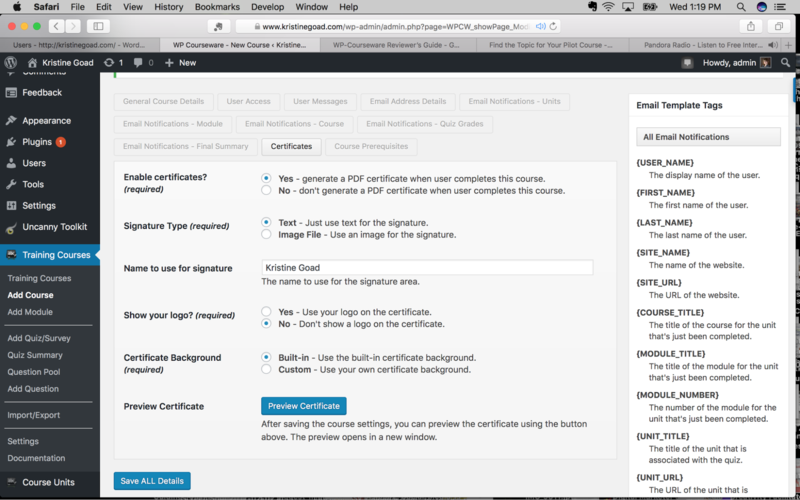 The course completion certificate is a built-in option in the WP Courseware plugin (this is not true of other LMS platforms). You also have the option to either upload and configure your own certificate or use the provided certificate. 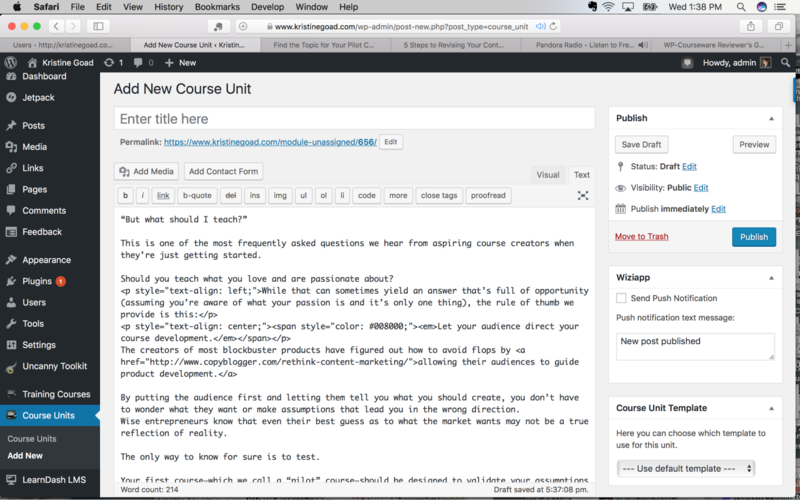 You create your course material in the same WordPress visual/text editor with which you may already be familiar. This means you can customize your page as much as you’d like, including adding links out to other materials or sites, adding video or audio, and sharing PDFs or other downloadable materials. 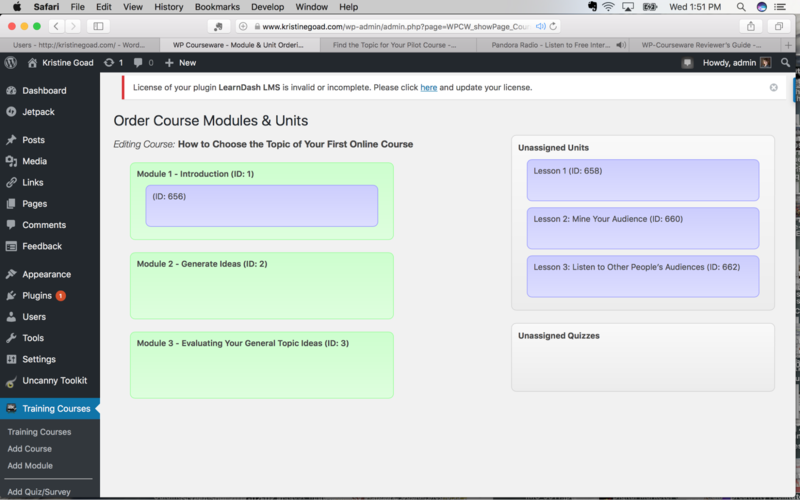 Then, you order your course content using the promised “drag & drop” feature, pulling the units into the modules. This gives you a lot of flexibility to easily change your course if you decide that you’re teaching things in the wrong order, or if you realize there’s a gap and you need to insert an additional unit or quiz. There are several quiz question options to choose from: multiple choice, true/false, open-ended, and an option that requires a student to upload a file. While it might be nice to have a sorting or matching question format, this list seems perfectly adequate for most needs. 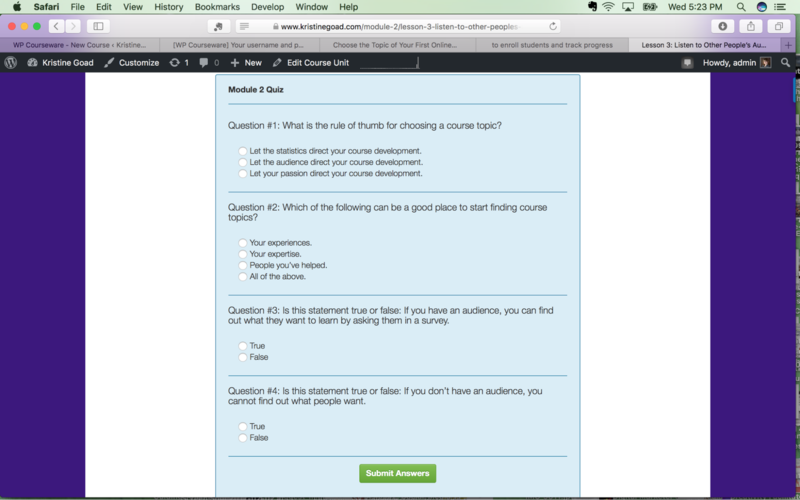 WP Courseware also offers you the option to either have all of your quiz questions available in a single view (as though it were a standard quiz on paper) or to paginate your quiz so individual questions or question formats appear on separate pages of the quiz that students move through. 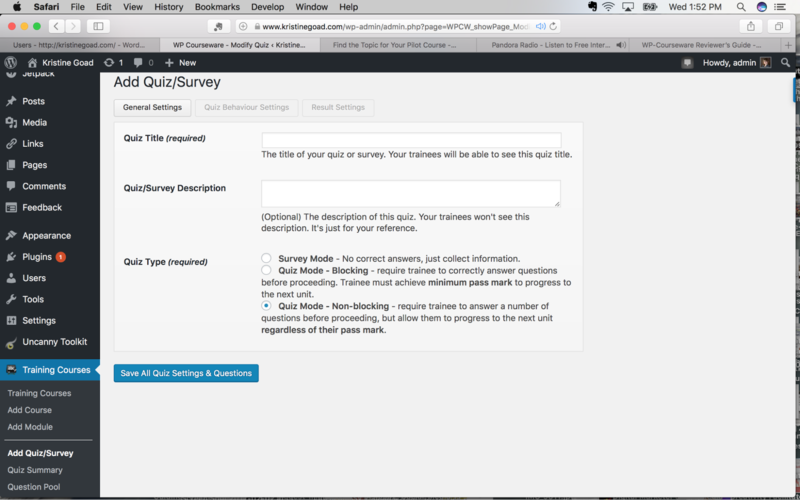 You can add questions to a Question Pool so you can re-use them in other quizzes later. You can decide whether to randomize answers on a question-by-question basis. You can decide whether a student must pass the quiz before allowing them to continue to the next unit or module. After you have uploaded all of your course content, created your quizzes, and dragged all of the Modules, Units, and Quizzes into the order you want them to appear, your course is complete. 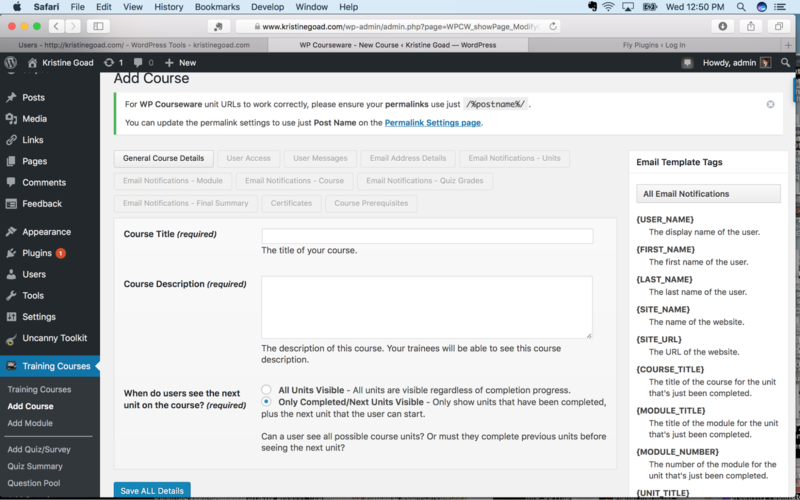 The problem is, you can’t yet access it as a course until you create a course index page. While it would be awesome if the plugin did this for you automatically, there’s a video tutorial on how to do it. It’s super simple to do using shortcodes available in the plugin. 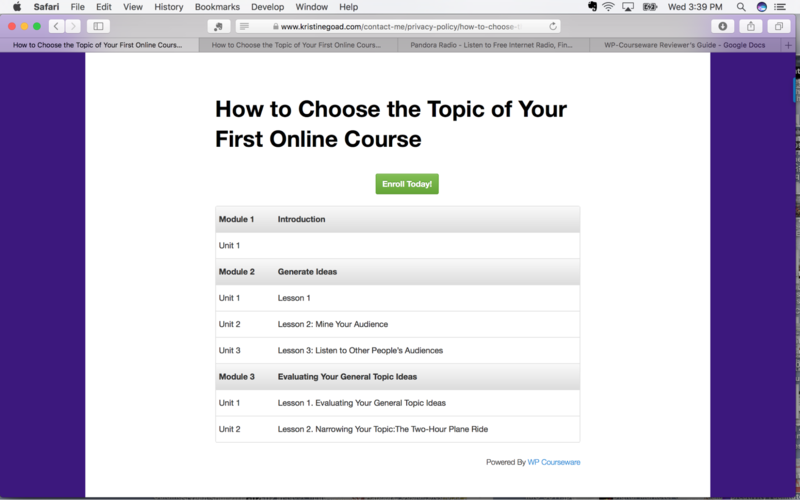 After a student enrolls, the course content will become hyperlinks to take the student through the course. If you are dripping content or requiring students to complete the modules and units in order, only the first unit will be hyperlinked. The tricky thing for me is pointing someone to this page as soon as they enroll. Remember, I’m not a WordPress whiz. I’m sure there’s a fairly straightforward and simple process that I don’t yet understand about creating Users on a WordPress site—which is exactly what you do when someone enrolls in your course. Once they enroll (if you allow them automatic access), a student is taken to a WordPress dashboard page that lets them configure their color choice and profile… but doesn’t immediately direct them to the course index page. I’m confident that figuring out this final piece of the puzzle will be the cherry on top of an otherwise intuitive, easy, and pleasant course-building experience! Pricing is for one year and includes all upgrades and email support. Renewals at end of the first year are discounted 30%. An extensive array of integrations available is (108 choices currently) for additional annual fees to extend functionality, such as Slack (for course notifications), BuddyPress (for community building), or Freshbooks (for accounting). Integrations – The Starter Package lets you pick-and-choose your integrations and affords a 30% discount over purchasing separately. I liked a WHOLE LOT about this plugin! It really was drag and drop easy and a pleasure to use. My favorite feature, though, is what I am calling the Magic Dashboard that lets you set up your course structure, communication with students, and the overall student experience. 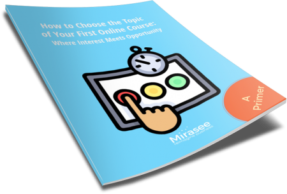 This feature combines much of the done-for-you functionality you would find on a stand-alone online course marketplace site with the ability to customize your course and create it on a site you own and control. One other plus is that there is the availability of both short video and text support documents, so you can choose based on your preferred learning style. I emphasize the “short” video segments as a plus. This way, you watch a video about your specific question or problem, without having to sit through a bunch of extraneous information or fast-forward searching for the piece that’s relevant for you. I love the huge range of Integrations that work with WP Courseware to extend the functionality of the course, but I’m not excited about the cost of adding those integrations. As far as I can see, I can create my own “Buy Now” button with PayPal and put it on a sales page I create and host on WordPress and all that would cost me is a bit of time. However, if I want to use any of the e-commerce integrations, such as WooCommerce or Easy Digital Downloads (which has an extension that will work with Stripe or PayPal Pro), there will be an additional charge. NOTE: If you are going to use Integrations, check out the Starter Package option that will allow you to create your own package and provide a savings of 30%. WP Courseware is a great option for someone who wants to create a course on a website they own and manage, have flexibility in customizing their course, and still enjoy the support, structure, and comfort of having much of the course functionality and architecture already configured. 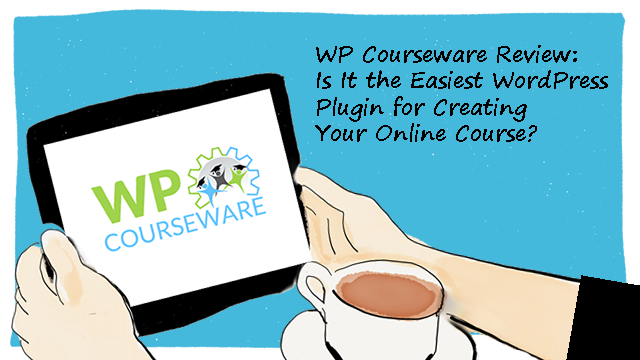 WP Courseware combines the ease and structure of an online learning marketplace with the flexibility and customization of a plugin. You may pay more for this plugin than others if you use additional Integrations, but the ease of use may make up for that, especially if you are not a WordPress pro but want to look like one. Create a course outline with the title of each module and/or lesson, a description of what your students will learn in each, and a list of downloadable resources you want to include. Create or curate the content for each lesson, including writing the text, creating videos, recording audios, selecting photos, writing quizzes, or designing infographics (Remember: it doesn’t have to be fancy to be effective! Play to your strengths and don’t spend a lot of time learning new techniques in the beginning.). Decide whether you will upload videos directly to your website or host them on Vimeo, Wistia, or somewhere else, and take care of any uploading to those hosting sites. Decide whether you will integrate payment into the course with one of the e-commerce or membership Integrations with which WP Courseware partners, create your own simple PayPal button, or manage sales elsewhere. Decide whether you will create a sales page and where that will live. Decide whether you will want to extend the functionality of your site through the Integrations WP Courseware offers and create your Starter Package. Enroll in the WP Courseware demo course (on the Demo.WPCourseware.com site), “Online eLearning 101.” The course is set to require that you complete each module before unlocking the next, but if you don’t want to spend the time going through everything, you can just click each module complete with the button at the bottom, use common sense to complete the single quiz, and then skip around the content as you have questions building your own site. Bookmark the support.wpcourseware.com page. You won’t spend a lot of time there, but it will have the answers you need if you get stuck. Bookmark this playlist of tutorial videos, so you’ll have ready access to the how-to demos in sequence. 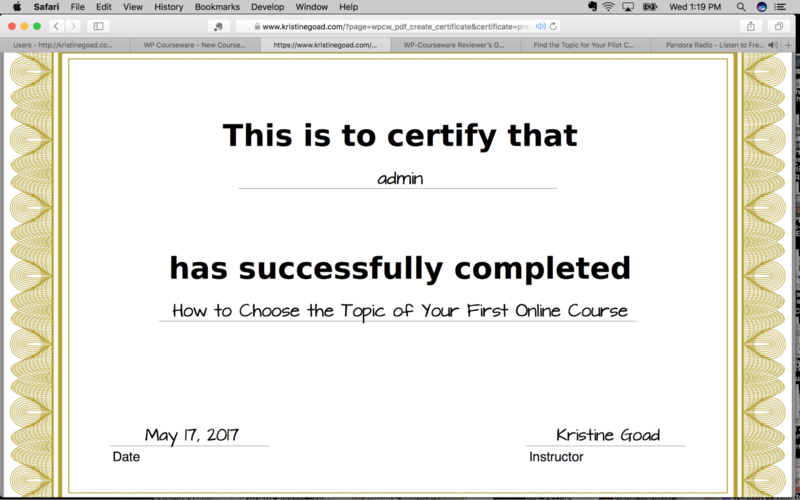 I would recommend this plugin to anyone who wants to quickly and easily create a professional-looking, online course on a website they own. There are plenty of options for customization, personal creativity, and adaptation to your teaching style and learning outcome goals. Nevertheless, you won’t find yourself confused or overwhelmed along the way. The huge range of available integrations adds the ability to include community engagement, monthly membership or payment plan options, marketing, and accounting functions. There’s a whole lot of other things I didn’t have the opportunity to explore, making this a versatile plugin that will grow with you as your expertise grows and your needs change. What feature are you most looking for in a platform? If you have built courses in the past and are looking at switching platforms, what problem are you hoping a new platform will help you solve? Let us know below so we can offer suggestions! If you put those same shortcodes in a text widget in the sidebar, then the course and lessons are accessible from any page that widget appears on (assuming the person is logged in). No index page needed. Awesome, Deborah! Thank you for the tip 🙂 Exactly the kind of thing a newbie like me needs to know. Brilliant article. Really impressed. Great clarity about what works/ doesn’t work, what the writer knows/admits they don’t know, and who can get most benefit from the plugin. Also a clear overview of how it works so that we don’t have to take their word for it. Thank you. Thank you for the kind words, Jacqueline! I especially appreciate your comment about not having to “take their word for it.” I tested 4 platforms for this blog series and each one has had things I loved and things I had to spend time figuring out. I’m really glad Mirasee is doing this review series to help people save time (and maybe money, too) in making a choice that will work for their needs! I wish you all the best with your coursebuilding adventure! Very nice article. But… I’m wondering how to manage user login, like you mentioned too in your review. Is there someone who can help me with some tips which “membership” plugin fits with WP Courseware. I don’t really want to sell courses, I’m a teacher and first I want to put some extra material and quizzes online. I want to make users and user groups to give access to courses and free downloads for logged in users. I searched the internet and there are many download plugins and member plugins? But which one? Does someone have any idea? Thank you for this review! Very Helpful! I tried to purchase this, but it didn’t work. The username and password did not register. I can’t afford to waste any more time on this. @Wendy Owen – Sorry to hear about your frustrating experience with this plugin. I hope you’ve reached out to their customer support?